Here are two treasuries that I made today at Etsy to showcase great gifts for Valentine’s Day – they are all hearts and roses …. you can’t get a better than roses and hearts for this special day!Â If you have an account at Etsy, any clicks and comments are greatly appreciated!Â You can check out my Etsy Shop. Here is another Valentine’s Day Treasury … any clicks and comments are appreciated!Â I am realizing as I get better each day, that actually I have been sick for a whole week already – but I didn’t catch it right away.Â Thanks so much! Quick post today … Here is a dreamscape … I have been sick the last few days … so this probably expresses my sense of overwhelm from not feeling that well. Remember to participate in my free giveaway -Â you can see mine right hereÂ One World, One HeART GiveAway.Â It is free to enter … I would love to hear how you are doing. Thank you for stopping by! 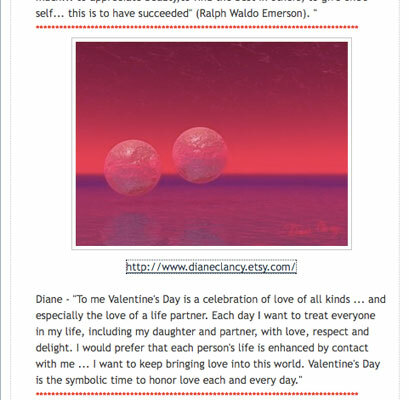 Valentines Day – great, inexpensive gift ideas – showcasing the vibrant, colorful, painting of bubblescape Love Birds. Enter Diane Clancy’s Art Free GiveAway. I think particularly the Love Birds is great for Valentines Day – so here is a card for you with the Love Birds on the front. You can see it at http://zazzle.com/dianeclancyart. I think this round ornament is lovely! !Â You can find the specifications at the link.Â I think it can also be a pendant also but it is sold as an ornament.Â I love this one! To me this looks like Valentines Day! I hope you enjoy seeing these vibrant, colorful paintings here! How are you doing? I am under the weather – so this is short.Â Thank you so much for coming by today!! With Valentines Day around the corner, these are some great, inexpensive gift ideas – showcasing the vibrant, colorful, painting of bubblescapes Love Birds. Here is a mug that I put together today … there are more choices too!Â I hope you are wanting to check it out and see what you think! It you prefer ACEOs, this last one is an Art Card, ACEO from my Etsy Shop.Â There are lots of other Valentines Day ACEOs also … I hope you enjoy looking around and perhaps even buying if something grabs your fancy! I hope you enjoy seeing these vibrant, colorful paintings here! How are you doing?Â Thank you so much for coming by today!! I like to enter the 2 Things Challenge each week. This week is Local & International. This is my entry for Local & InternationalÂ – I hope you can guess which Local and which is International!Â I hope you like it! !Â I know the landscape is similar, but the lighting was decent for showing off the various textures.Â Here are the entries for last week’s Paper / Plastic. Anyone can join in, and I hope you give it a try!! We would love more people playing with us! Details are at this link above. Kara is also participating in the One World, One HeART GiveAway – you can find her giveaway here and you can see mine right hereÂ One World, One HeART GiveAway. I am going to show you some images … with links to these specific pages where you can see more. When several images link to the same page, I put a link only on the name of the first image. Mother Henna by artist Kara L.C. Jones has been working on an incredible project of making 1,000 Faces of Mother Henna. I have wanted to write about her work for over a year … her handling of color in these vibrant, colorful paintings remind me of how I handle color too .. but then I always love others work too … and wish I could create like Kara! This is one of the many variations where she talks the same basic structure and plays with color.Â I am sure many of my readers will recognize this method with my bubblescapes.Â It is amazing to me what the change of color does! And this is yet another variation – I LOVE them! If you read Kara’s blog on a regular basis, she will share many of the joys and struggles she has experienced and lived in her life.Â She makes many kinds of art, but these colorful images I find incredibly striking! This was from one of the first posts of Kara’s I ever saw – and it just grabbed me!! The power is intense to me!Â There are yet more variations of this image on this post. Just lovely! I have spent hours opening up different pages of Kara’s and choosing only a large handful of her images to show you … she is one fine woman and creates lovely art! Kara is also the one who sponsors Celebrate HeART I speak about in this post of mine. Remember to participate in our free giveaways – Kara is participating in the One World, One HeART GiveAway – you can find her giveaway here and you can see mine right hereÂ One World, One HeART GiveAway.Â I would love to hear how you are doing. Thanks for coming by!! Win 2 free cards!! It’s that time of year again! For the worldwide One World, One HeART GiveAway – I am pretty excited! !Â There are already over 400 blogs giving away gifts to people who enter their giveaways! !Â You need to leave a comment to participate – of course with a way to contact you. Details for you to join in your own blog are here. Lisa Oceandreamer started OWOH 2 years ago and she has a blog here which lists all the blogs involved and gives the details. If you are thinking of joining in and having your own giveaway, please go there and get the details. Lots and lots of blogs are giving away items – to show love and build the blogosphere. So once I knew, how can I resist? My give-away will be two of any of these cards of my vibrant, colorful paintings. You choose which ones and I will send them to you – for FREE. (and yes, you can choose 2 of the same). You have until February 11 (at least at most blogs) to leave your name and join in each blog’s give-away. If you want to win the give-away, leave enough information for me in a comment to this post so I can get a hold of you. Remember your email is hidden so it is safe with me. I will accept all entries until midnight eastern time on February 11 and then the winner will be announced on February 12 … and then your gift will be coming your way! To ANYWHERE in the world! Here are more details if you would like to participate. There are tons of blogs participating … so gone on over and check them out! I know I plan to!! Also this list will stay up for 6 months after the event ends – so it is a great way to find wonderful new blogs! The prize is any 2 of these cards. The size is 4.25 x 6″ and they are professionally printed. I look forward to seeing who wins! !Â Starting in March I am going to be doing a monthly giveaway of one of these cards – your choice – in exchange for allowing me to put you on my email list … this is NOT for this giveaway – but for the one starting montly in March.